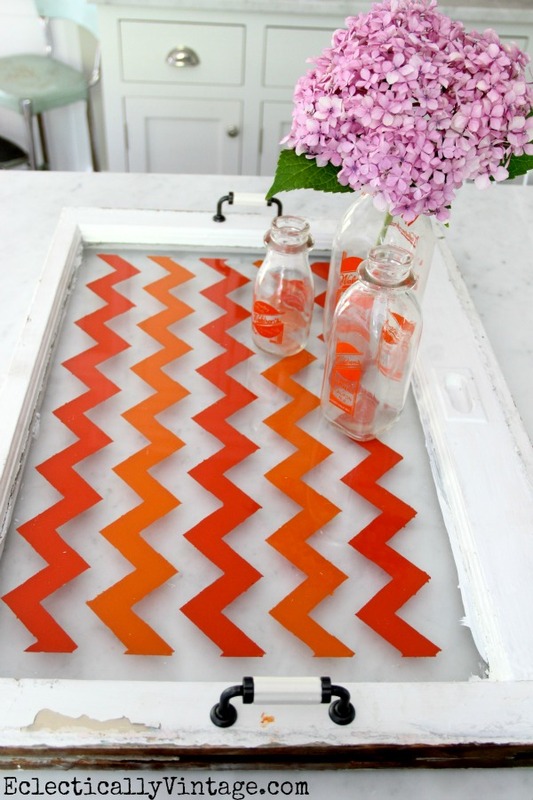 How to Paint Chevron - the Easy Way! not like a scene from an Austin Power’s movie (my parents recently removed the green and yellow beads used as bathroom window treatments)! Don’t go out and buy a chevron sofa – only to find it’s in the category of the avocado green refrigerator after a month. minimal investment for maximum impact. Want to see what I made with the other window I found in the dumpster? 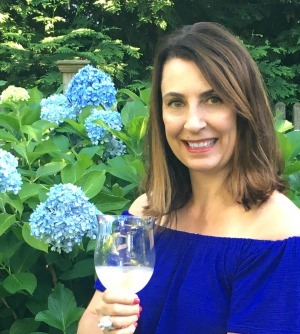 Thrilled to be part of 12 Months of Martha – where I create something fabulous every month from a mystery box from Martha. See my full disclosure policy here. Excellent! That’s what I keep telling people who are buying big chevron couches and buffets! They should buy a chair that has an easily recovered seat and put some chevron on that or recover a lamp shade but don’t put chevron stripes on your wall for heaven’s sake! 🙂 Love the tray – it is perfect! love it! I would have never thought of that. genius! Hope Haven was fabulous. So jealous! i LOVE this, kelly! it came out so cool! 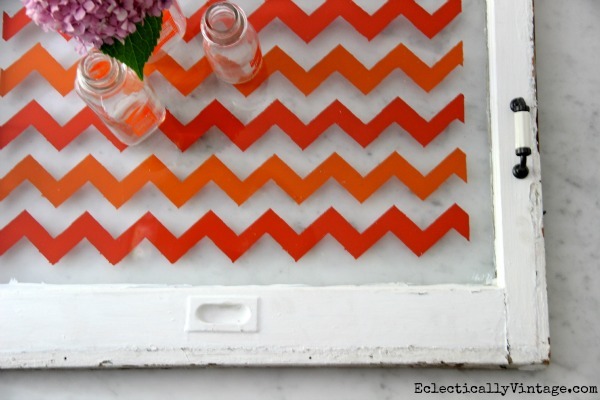 Agree with you on small doses Kelly, especially chevron – love them on pillows and art and now trays too! I don’t know ow you come up with these idease, but they are always interesting and turn out beautiful in the end! Kelly this is very pretty! Just beautiful Kelly…and love the color!…So happy to have spent time with you at Haven!!! 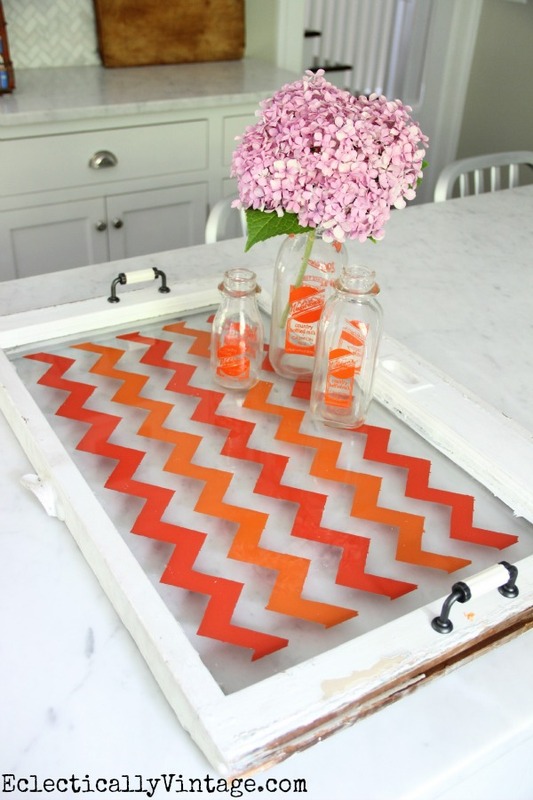 This is very clever — I love the idea of doing this right on the glass too! Adorable! Another way I can use my craigslist windows! Thank you Kelly! Supercute tray! 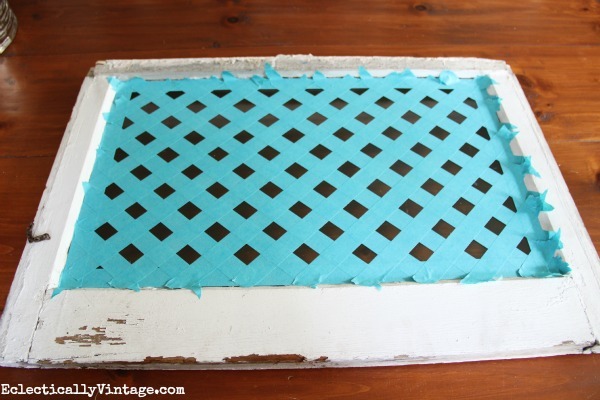 Right now I’m loving the vintage paper (a trend I hope sticks around) trend. Wreaths made of old sheet music are classically classic. How cute is that! I love the colors. Very cool. I am loving the pop of Orange. I hear Avocado colored appliances are making a comeback, along with green shag carpet, and mustard yellow refrigerators, oh, and dark brown linoleum (because it hides the dirt). Wait, that was my childhood home. Kelly, your tray is gorgeous! I especially love the colors that you used. Thanks for the great tutorial-now I just need to find some old windows! I love this Kelly – so pretty! 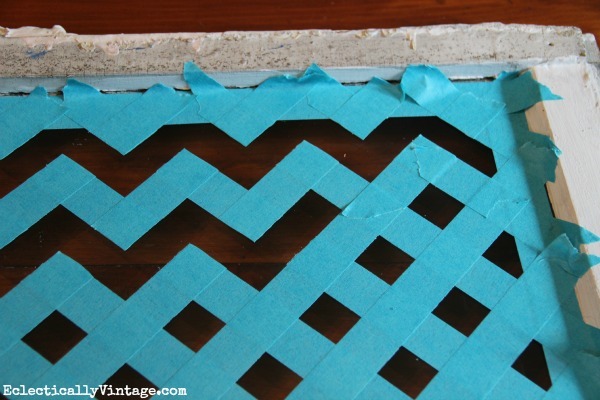 Great tip on taping the chevron, thanks! Can I just tell you how much I love this!!! 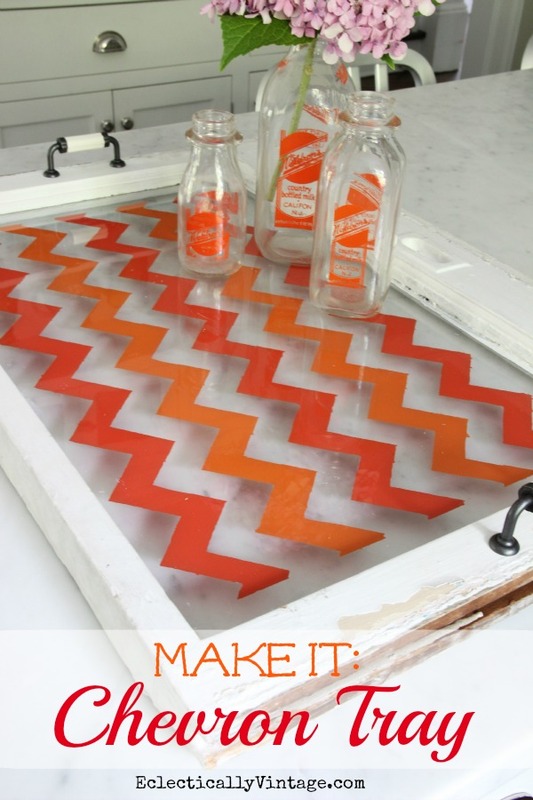 I love how you made your chevron lines. Never thought to make them like that. This looks great! The orange really stands out, and it looks pretty easy. 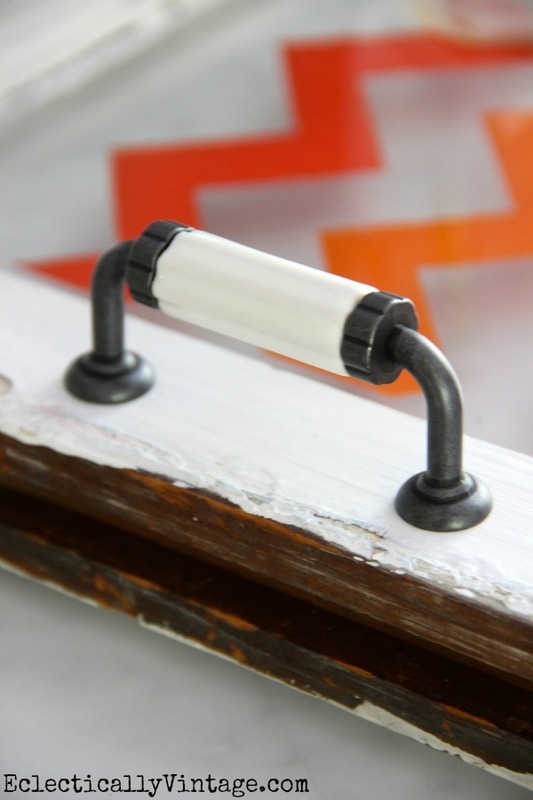 My wife is an avid crafts person and would love this! Thanks! Smart way to do it! Both technically and in small doses 😉 I completely agree and just painted an accent wall in navy and white chevron. When the trend is over, just a little paint and money and I can move on to the next trend. Kelly, this one is cool!! Sharing on FB… BTW, is there anything you can’t do girl?!? Kelly, I love this tray. What a beautiful idea!! 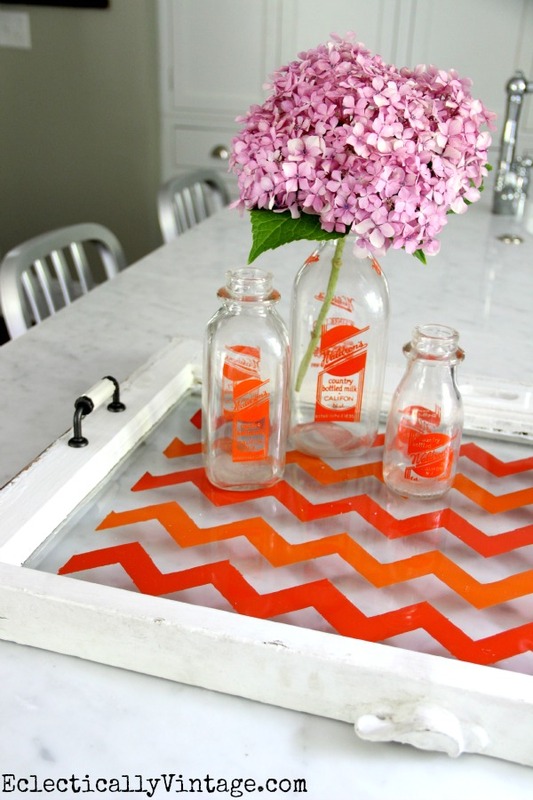 This really has a “wow factor!” What a great summer entertaining tray! Great job, Kelly! 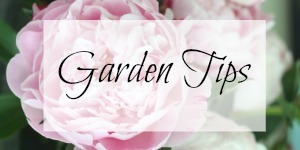 I agree that trends are fabulous in small doses, and this project is the perfect example! I love this! I couldn’t agree more about not going overboard with the chevron. I have yet to really do anything with it but I usually wait on trends so am always “behind”. lol This is fabulous! Pinning! LOVE!!! The hunt for a antique window is on!!!! THanks for posting! Great instructions! What a great idea! 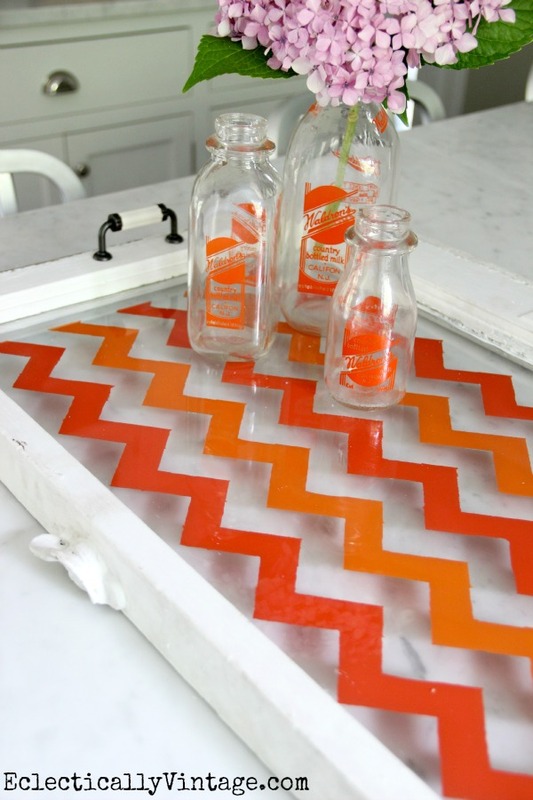 Love the tray, can’t wait to find something I can paint chevron! what kin d of paint, oil, regular house paint, acrilic, or glass paint?? ?